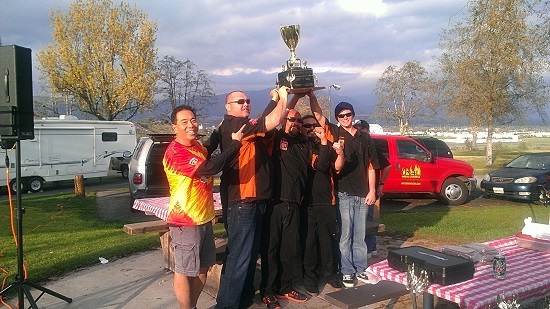 Congratulations to Left Coast Q (Matt, Moe, Mathew, and James) for winning the California Barbecue Association (CBBQA) 2012 Season Team of the Year TOY! 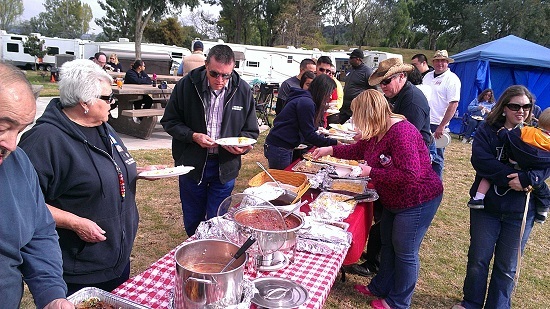 Every February, pitmasters, officials, judges, family, and friends from all over gather together at the Eastshore RV Park in San Dimas about 30 miles east of Los Angeles for our version of the Academy Awards. 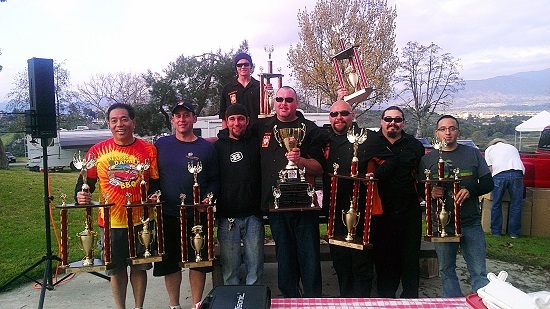 This special annual event honors and acknowledges the top teams from the previous season with trophies in the top-10 in each meat category and top-20 in overall standings. Slap Yo Daddy had won the TOY for 2010 and 2011 and it was time to turn over the tiara to Left Coast who scored the most points in the 2012 season. I had a busy year in 2012 and strategically chose to forgo contests in the state to compete in Kansas City, Lynchburg, Hawaii and to England. This opened a window for several teams to pass me in the points standings as I missed out on a couple of large California contests. 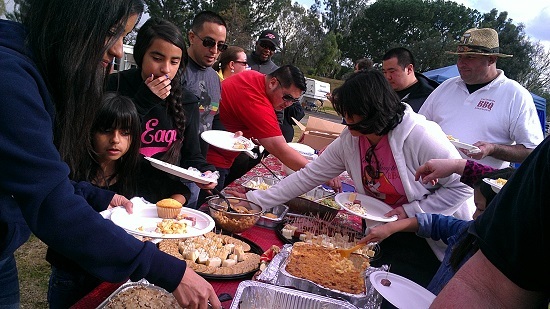 Overall, SYD finished a respectable 4th place in the California TOY tied with Woodhouse BBQ. In the Chicken TOY category, SYD finished 2nd overall despite finishing 1st in the nation at the KCBS Chicken TOY Champion in Kansas City. 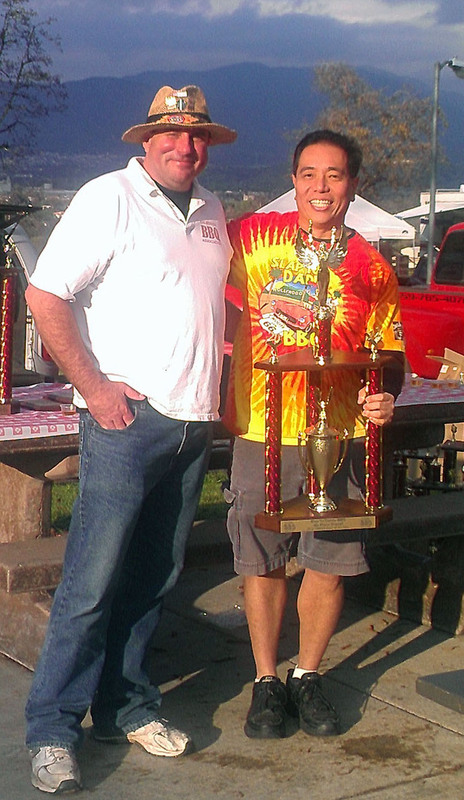 A big congratulations goes out to my SYD student Jerry Aguilar of Burnin n Lootin for winning the Best New Team Rookie of The Year ROY award for the 2012 season. Jerry took the lead early in 2012, never looked back, and left the rest of the rookie teams in the dust. I’m very proud of Jerry for his performance and for winning two grand championships (Golden Acorn and Dana Point) in the 2012 season. 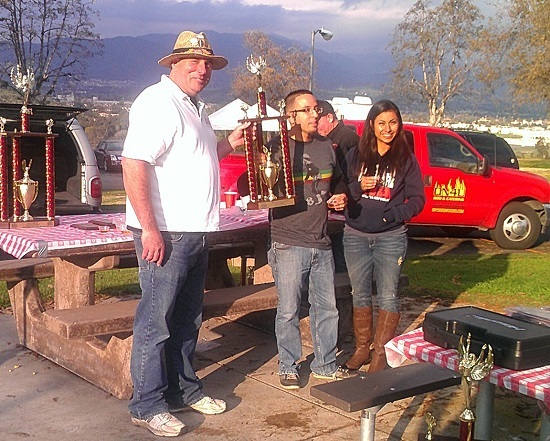 The past five CBBQA TOY winners were all ROY winners in prior years (SYD was ROY in 2009). I am hoping Jerry continues that tradition for 2013 and beyond! 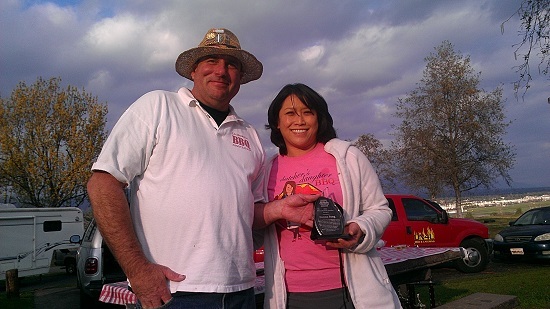 A big congrats also go out to Rick Gilbert and Andy Soto for the Brent Walton award for outstanding service, Bill Keyes for being inducted in the CBBQA Hall of Fame, and Donna Fong for the Presidential Service Award for leading the CBBQA Sauce Review, developing the California BBQ Institute classes, and creating web content.